Michigan Residents: Is Someone Spying on Your Home or Business? Hidden cameras, audio bugs, and GPS devices can catch you in your most vulnerable moments. If you own a business in Michigan, someone could steal your business secrets. Most people don’t think that anyone would have a reason to spy on them. Yet, it’s more common than you’d think. Why Are Hidden Cameras and Audio Bugs Used Against Regular People? We’ve all watched movies or television shows that depict a celebrity, politician, or filthy rich business owner that’s being watched. Of course, the premise is that the person has a certain secret or may be the villain of the show. It could be that the villains in the show plan to kidnap that person for ransom. Of course, that’s fiction. If this were happening in real life to a celebrity, politician, or business owner, that would be terrible. However, it’s sometimes easier to at least wrap our minds around the fact that someone powerful may have people out to learn all of their secrets. Surely that wouldn’t happen to a regular business owner or a private citizen….would it? You own a business that is doing well in its space. It doesn’t have to be a huge, million dollar business. People want to find out how you’re dominating the space or they want to find a way to ruin your business. You’re involved in a child custody dispute or a divorce. Break ups bring out the worst in people. The other parent could be using GPS devices to know where you go, hidden cameras to watch what you’re doing at all times, or using an audio bug on your cell phone or landline. You’re involved in a civil lawsuit or have an insurance claim of some kind. The most common lawsuits involve personal injury. Most of these lawsuits first start as an insurance claim as some kind. Another insurance claim that may involve spying is a workers’ compensation claim. While it is the legal right of an employee who is hurt on the job to file a claim, the insurance company may result in some dishonest practices to try and prove you don’t deserve benefits. You’re involved in a relationship with someone who is emotionally, mentally, or physically abusive. Hidden cameras, audio bugs, and GPS devices are frequently used in abusive relationships to help the abuser maintain control over the victim. If you’re being abused, please contact a domestic violence hotline in your area or contact The Hotline either through their chat option or over the phone. You’re a renter. Sometimes, landlords just don’t know any better and think that they have the right to use hidden devices to ensure their property is protected. Sometimes, landlords know the laws forbid the use of spying on tenants and choose to ignore it. You’re being stalked. It’s a scary thought. You may not even know who is stalking you. If you believe that you may be a victim of spying, contact Spy Catchers right away at 1-800-373-8726. 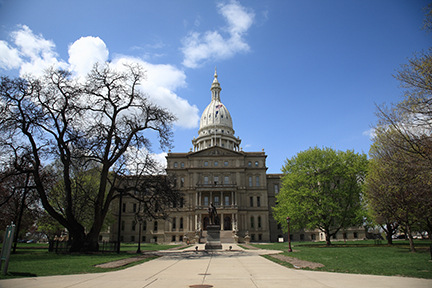 Are Hidden Cameras, Audio Bugs, and GPS Devices Legal in Michigan? Hidden cameras are not legal if they are placed in areas that would be considered private. It is also illegal for a person to go onto property without the permission of the owner to place a hidden device without the permission of the property owner. When it comes to recording conversations, which is the purpose of an audio bug, it is illegal to record a conversation without the permission of every party involved in the conversation. Sometimes, an exception is made if the conversation takes place in a public space where there is no right to privacy. Additionally, even if a hidden camera is used on one’s own property, there may be an issue if the video is presented in court and there is audio. This is a common scenario in nasty divorce cases and child custody cases. It’s also commonly used in domestic violence situations. Many vehicles come with GPS devices pre-installed. Those aren’t the GPS devices we’re referring to when we look at legality. We’re referring to GPS devices placed in an effort to keep tabs on another person without their knowledge. It is not legal to use a GPS device to track another person without their knowledge. There are some exceptions to the law including a parent or guardian tracking a vehicle that their child travels in and if it is being used by a licensed private investigator to try and get evidence that will be used in a court hearing or reviewed by a board, officer, or investigating committee. What Are the Signs of a Hidden Device? Hidden devices, regardless of whether they are audio bugs or hidden cameras, are exceptionally small. They can be placed almost anywhere. If you still think that someone may be spying on you despite not seeing any of these signs, call us. If the device was professionally installed, there may be no tell-tale signs. Spy Catchers LLC will come to your Michigan home or business and perform a professional bug sweep. Dust from the ceiling or wall on your furniture or floor. You notice new art work, calculators, lamps, or books that you did not place in the room. If you own a business, your competitors start winning projects that would normally go to you. There’s a noticeable difference in the quality of your calls that were once clear. If you believe that there may be a hidden camera, audio bug, or GPS device invading your privacy, call Spy Catchers now at 1-800-373-8726. Don’t wait. We want to help you regain your sense of security!